Posted on Sat, Mar 10, 2012 : 10:14 p.m. 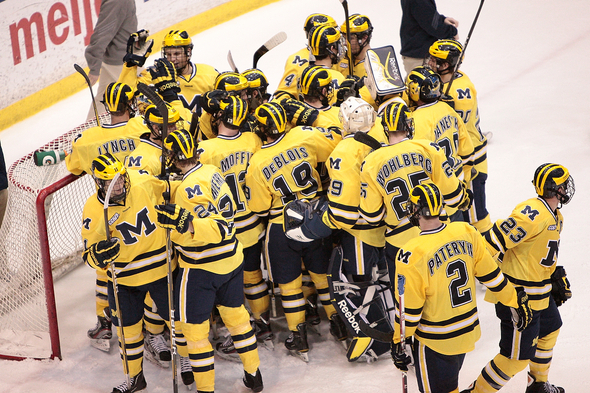 The Michigan hockey team celebrates its 3-1 win against Notre Dame at Yost Ice Arena on Saturday. The win gave the Wolverines a CCHA playoff series sweep. For as long as any of the players on the Michigan hockey team have been alive, the team has advanced to at least the semifinal round of the CCHA playoffs. The 24-year-old, fifth-year senior -- the frequent subject of "old man" jokes in the Wolverines' locker room -- made 25 saves as Michigan beat Notre Dame, 3-1, at Yost Ice Arena on Saturday to complete a sweep of the best-of-three series and advance to the conference semifinals for the 24th consecutive year. Hunwick got a little nostalgic with his final game at Yost finally in his rearview mirror. Reflecting on his career, Hunwick called himself the beneficiary of the most lucky breaks in Michigan hockey’s storied history, listing them one-by-one. Steve Jakiel leaving early, two injuries to Bryan Hogan, top prospects Jack Campbell and John Gibson opting to go pro instead of coming to school. Hunwick’s spot on the Michigan roster was created, reinvented and reestablished by all those events over the past five years. Those breaks didn’t matter this weekend. All that mattered was if he could stop the puck, and he did exactly that, saving all but one of 26 shots Saturday to follow up his 37-save performance from the night before. Hunwick said he was saddened by the thought that he was skating off the Yost ice for the last time on Saturday, but grateful as well. "I thought I was going to play one minute, one game, hopefully on Senior Night, when I came here," Hunwick said. "To play this many games at Yost, I can’t be too upset about the career I’ve had here. The students here are unbelievable." Yost erupted during the final two minutes of play as Notre Dame (19-18-3) called a timeout to try to take advantage of a late 6-on-4. Michigan coach Red Berenson said that's one of the advantages of home ice, and a large reason Michigan (23-11-4) has been able to keep its streak alive. "This is special, and the players that have played here, they’ve benefited from that, I’ve benefited from it," Berenson said. "We earned it by getting home ice and then what a great crowd and what a great venue. How could you have a better situation?" After being whistled for just two penalties in Friday's 2-1 double overtime win against the Irish, Michigan had to kill off three penalties in the first period on Saturday. Berenson said he thought the fact that Saturday's game was televised helped keep the energy level up, despite having to kill so many penalties early and having a double overtime contest the night before. "If they didn’t have TV commercials it might have affected," Berenson said. "But you’ve got these two, too-long TV commercials and it lets your players get a breather." Following the third penalty kill, Phil Di Giuseppe came out of a scrum along the boards with the puck and found David Wohlberg, who placed the puck in the top corner just over the right shoulder of Steven Summerhays to put Michigan up 1-0 with just over one minute left until intermission. Wohlberg and Hunwick said getting the early lead was a huge advantage because of defensive-minded Notre Dame's ability to hold a lead and Michigan's struggles when playing from behind. Di Giuseppe stretched the lead to 2-0 in the second period and Wohlberg put in another goal that seemed would put the Irish away at the 12:09 mark. But it took Peter Schneider just 19 seconds to respond and keep Notre Dame's hope alive. Those hopes were dashed by Hunwick in the third period. Despite outshooting Michigan 12-4 over the final 20 minutes, Notre Dame couldn't find the back of the net. The Irish pulled goalie Steven Summerhays during a power play in the final minutes for a 6-on-4 advantage, but struggled to put shots on goal coming out of its timeout. Michigan's semifinal opponent Friday night at Joe Louis Arena in Detroit depends on the result of Sunday’s third and deciding game between Ferris State and Bowling Green. If the regular season conference champion Bulldogs win, Michigan plays Western Michigan. If the last-place Falcons win, they will play Michigan. Sun, Mar 11, 2012 : 3:43 p.m.
Is this team good enough to challenge for the NCAA championship? During the second half of the season, they have seemed quite amazing. 24th straight trip to the semis!!! That's consistency and excellence. Congrats to Red and the Michigan Hockey teams. Mon, Mar 12, 2012 : 12:55 p.m. It still hurts to think of that championship game last year. I agree that this team has everything needed to win it all. If they get some puck-luck another banner could be coming. I'm not sure whether I'm happy about playing BG or not. What a huge win for the Falcon's on Sunday. Sun, Mar 11, 2012 : 5:38 p.m.
You bet they are. Brown-Guptill-Wohlberg is one of the best lines in the country, and you have Glendening-Treais-Di Guiseppe putting the puck in the net. Add in Hunwick's absolutely outstanding play, and you have a favorite to win it all. Frankly, we were robbed of a National Championship last year with Carl's disallowed goal. Sun, Mar 11, 2012 : 5:23 a.m.
Again, just a-maize-ing! I absolutely loved hearing the PA announcer say &quot;You're welcome&quot; as the crowd did it's usual &quot;Thaaaaank you&quot; as the final minute of the game began. I remember how fun that was to be there in person. Hearing it over the radio feed was pretty cool. Go Blue! Sun, Mar 11, 2012 : 4:11 p.m.
What might not have come across the radio broadcast was that the &quot;How. Much. Time. Is. Left?&quot; chant was interrupted by a stop in play at 1:01, so the crowd kept chanting &quot;Is, is, is, is..&quot; until the clock re-started, and the crowd immediately yelled &quot;Left!&quot;... then the announcement went as you describe. That and the &quot;Better Goalie!&quot; chant when ND pulled their goalie... just a great environment!